Hello! 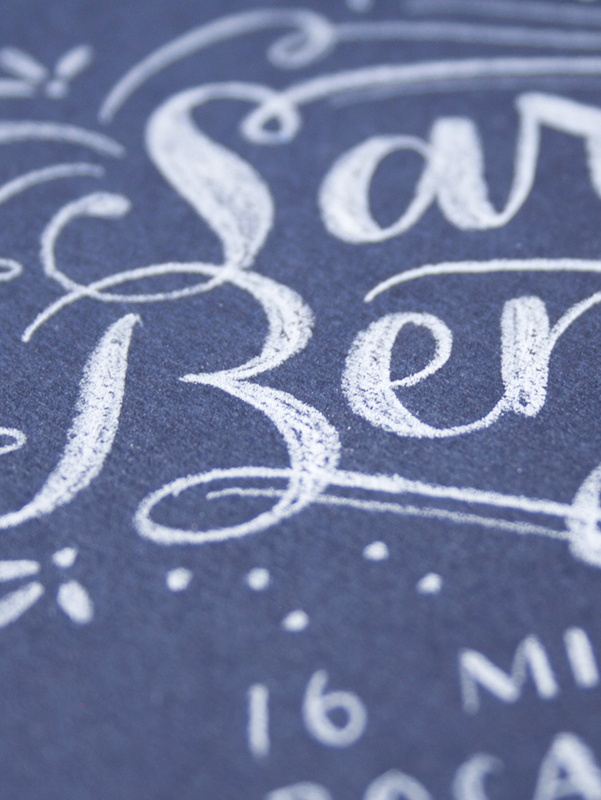 It's Megan here with another guest post about lettering, and I'm super excited about what I have to share today! One of my favorite 'simple pleasures' in life is opening up the mail box and finding a hand addressed letter. Tucked away inside the ads, bills, and catalogs, there's a special goodie just for me. Oh the joy! As I open it, I know that I don't owe the sender money, they aren't trying to sign me up for the latest credit card, and, even if what's inside is a simple 'hello', it can be a wonderful moment in my day. Today I am challenging you to take what you've learned so far in this lettering series, and put it into practice in a very tangible way. 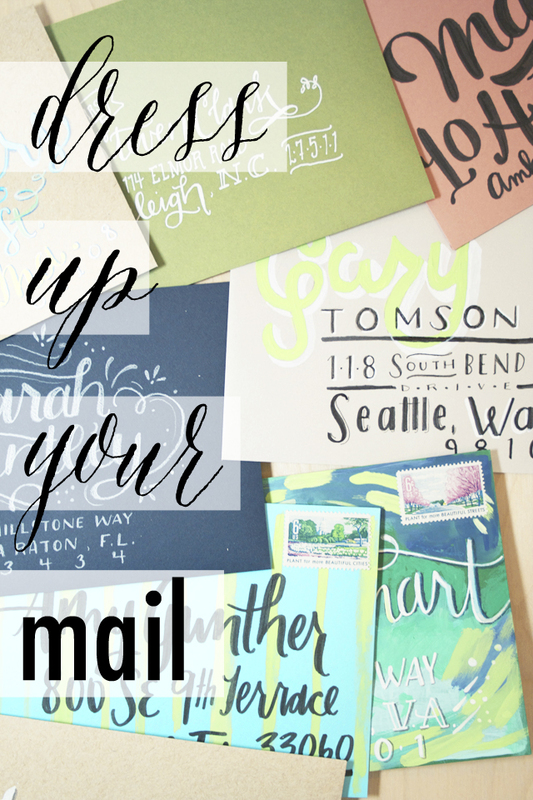 Send some snail mail! And just think of the smile you will bring someone when they receive your work of art! 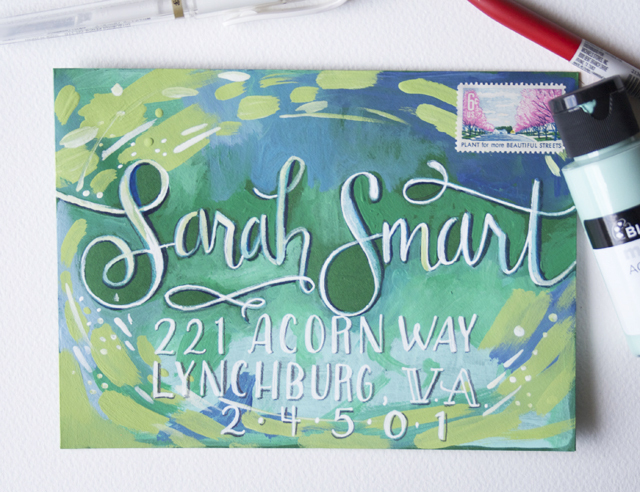 If you aren't super confident in your lettering skills yet, painting your envelope first is an easy way to dress it up. 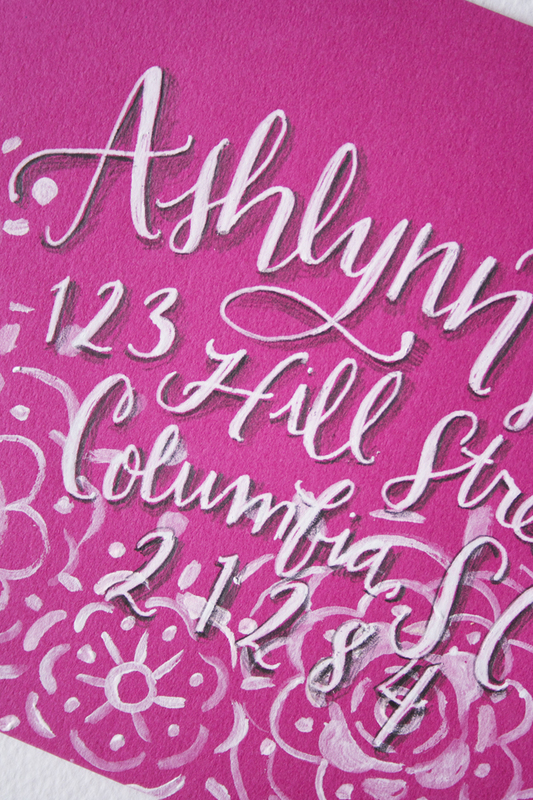 Painting simple patterns on your envelope before lettering is easy, but makes a big impression. 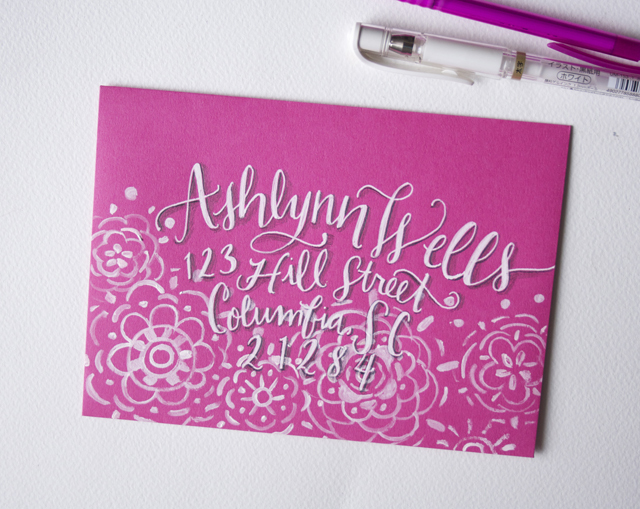 But if you don't have time for paint to dry, practicing your lettering techniques with pen and pencils can make just as big an impact. In the envelopes below, I used my white uniball signo gel pen to do the lettering, and then a graphite pencil for the drop shadow. 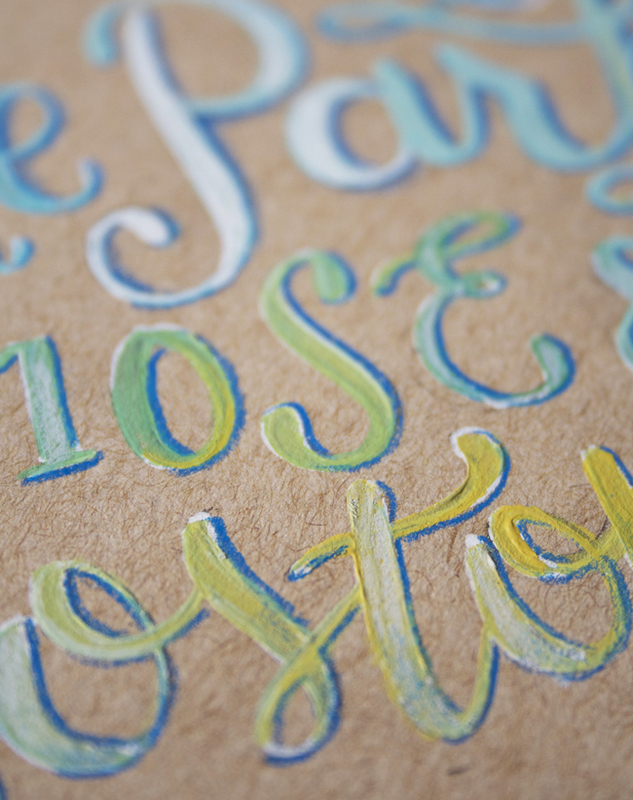 Or for an even softer effect, try using a colored pencil. With this navy blue envelope, I drew my letters with a white colored pencil. 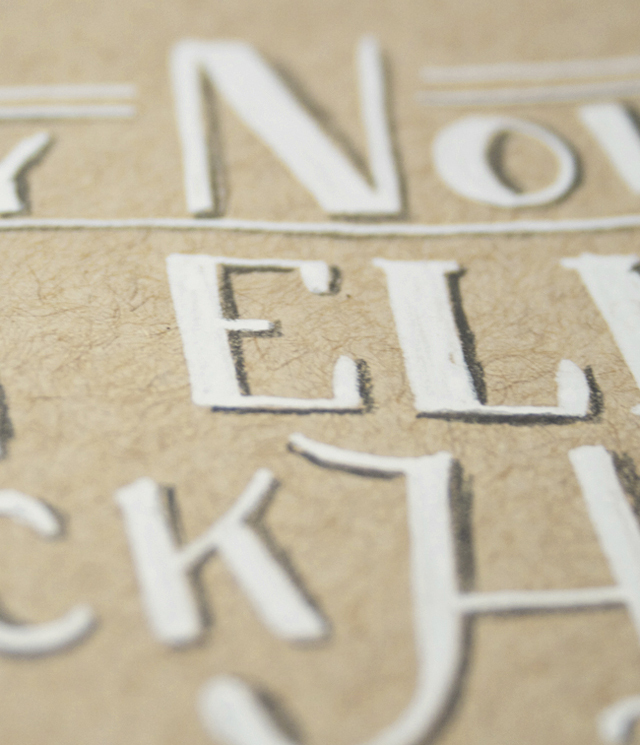 On the dark paper, it really pops - and almost gives it a chalky effect. 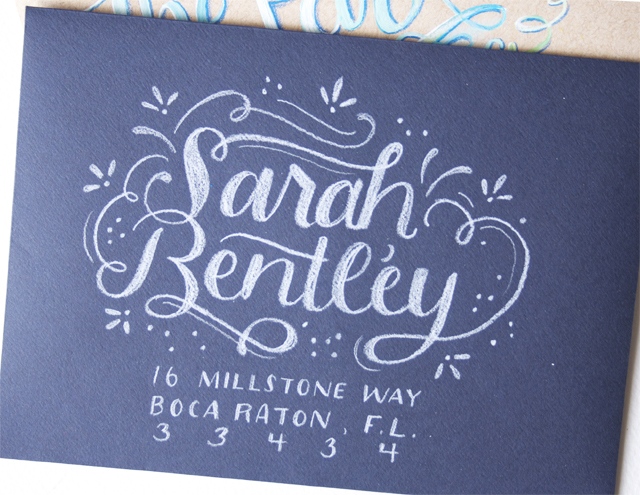 Little doodles and embellishments add a finishing touch. 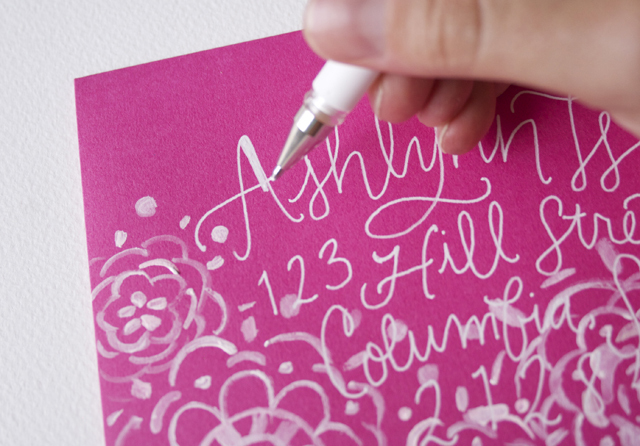 And if you have the time to make something extra special, try painting the name and address! 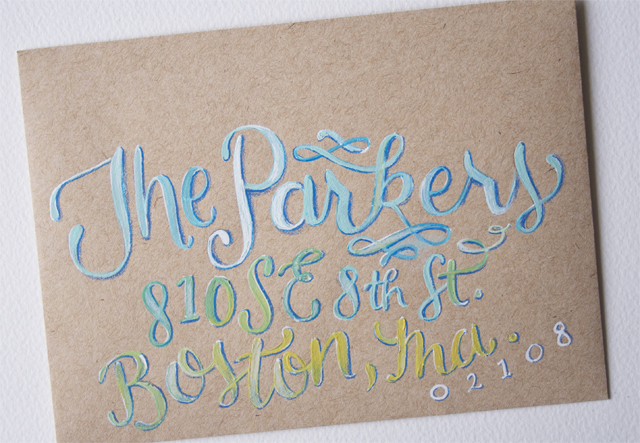 I love painting on kraft envelopes - the colors pop so nicely against the neutral brown. For this one, I drew the letters very lightly in white pencil before painting on top, adding a drop shadow at the end for dimension. So practice away AND brighten someone's day with your work. In today's world full of emails and texts, and hand written note says goes a long way. 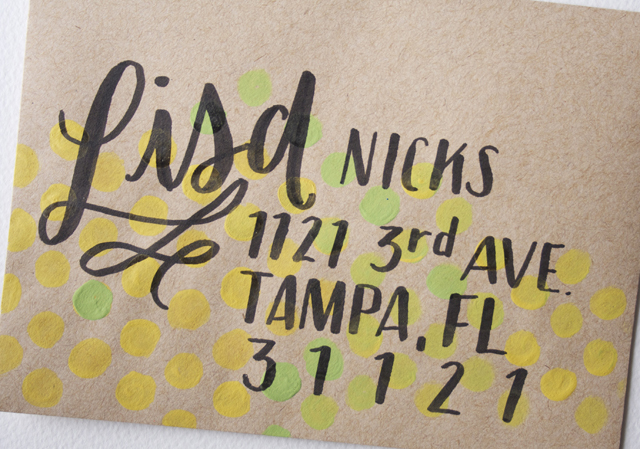 And with an envelope disguised as a work of art, your mail is bound to make someone smile! Remember to use #redefinecreativelettering on instagram to share what you've created! These are beautiful! I was just wondering what you do to protect the artwork - specifically, preventing the colours bleeding after exposure to water - its not always possible for post(wo)men to protect the mail from the elements and so the artwork and addresses might be obscured? I always put clear sellotape neatly in strips over the addresses this seals the ink, because you never know! Thanks for sharing these. 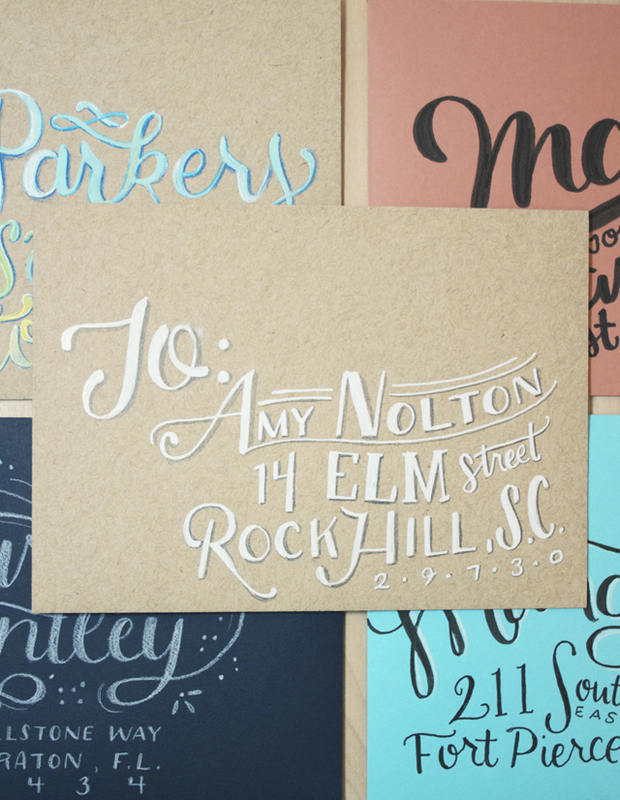 I love how you used pencil to create a drop shadow--what a great idea! And I agree, everyone loves snail mail! :) Pinning this to my letter-writing board. Have a great day! These are so pretty! I also love the drop shadow, it's so effective! I'll definitely be having a go myself! Total eye candy! Love this. Thanks for sharing. Hi! Great question - the only material I use that is not bleed proof is the signo gel pen - but I've not had a problem and I send a lot of mail! Also, I think the wear and tear of it going through the mail system just adds to the effect, as it might get bent, stamped, dirty etc. If you worry though, that clear sellotape sounds like a great solution! Love your style! Such great ideas here. Thank you for sharing with us. 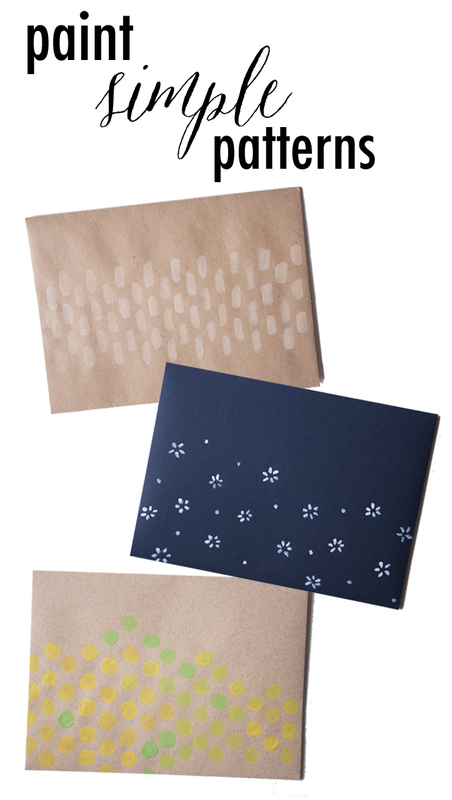 Beautiful envelopes! 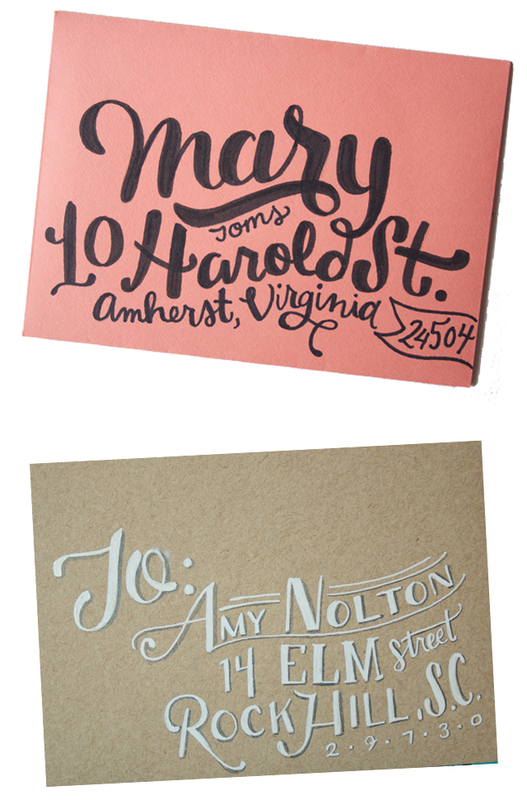 I adore sending and receiving snail mail and happily found this post via Pinterest. :) Such a cute blog you have. How beautiful to receive something like this in the mail. What a wonderful idea!!! Thank you for the much needed inspiration to keep my artistic side alive. You combined creating and giving, two of my favorite attributes.